Some years later, the original Poule d'Essai was broken out into separate races for colts (les poulains) and fillies (les pouliches). As for Prix du Jockey Club... everyone knows "prix" means "prize" or "race" but you might not know that "du Jockey Club" means "of the Jockey Club." Oh... maybe you did. It actually surprises me that this name got by the Académie française. With that short walk through history behind us, let's take a quick look at Silver Frost (IRE), winner of this year's running of the "Poulains." Silver Frost (pedigree) represents a standard breeding practice in Europe, wherein largely U.S. Thoroughbred bloodlines are intermixed with pedigree influences from continental Europe and Great Britain. In his case, his sire is an Irish-bred son of a French-bred stallion that descends from the best English son of Federico Tesio's Italian-bred Nearco. (Yes, this will be on the test.) Silver Frost's sire Verglas (IRE) at least has a fairly straightforward descent on his dam's side -- all U.S.-breds. With the exception of the Canadian-breds, of course. As for Hidden Silver (GB), dam of the French classic winner, she's an English-bred daughter of Anabaa, who was bred in Kentucky but whose great grade/group I wins came in England and France. Much like Verglas, Silver Frost's dam is mostly all-American in the first few generations, but has European influences not too far back including the sire of his fourth dam, the decidedly French stallion Herbager ("cattle grazer" or -- perhaps more poetically -- "horseherder"). Oh -- and through Hidden Silver, Silver Frost descends from Bruce Lowe family A1, one of the original American broodmare lines. So our Poulains winner comprises mixed nationalities. What do you expect for a race that is run at a metric mile? I've said a couple of times that Silver Frost has a preponderance of American bloodlines; his direct male line, however, is rather unknown on these shores. His sire, Verglas, managed an impressive win in the Coventry Stakes (gr. III) at Royal Ascot and grandsire Highest Honor (FR) was a Longchamp specialist whose highest honor -- ha ha -- was the Prix d'Ispahan (Fr-I) at that track, a victory that helped him become France's highweighted older horse in 1987. Next up in the sire line was Kenmare (FR), whose stakes success also came entirely in France; his best win was the Prix Jacques Le Marois (Fr-I). Three French grade I wins earned Kenmare's sire Kalamoun (GB) the title of champion miler in France back in 1973. The line back to Nasrullah and Nearco is completed by Silver Frost's fifth and sixth sires, Zeddaan (GB) and Grey Sovereign (GB). 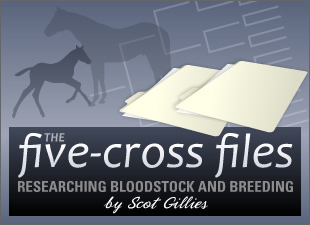 Looking at Silver Frost's five-cross pedigree, we see Northern Dancer repeated 4 x 4 in a pattern that seems to meet with success on regular occasion (specifically, crossing a stallion with a mare that descends from his own damsire line). Note that the cross that gave us Hidden Silver was the reverse: it matched Anabaa's Northern Dancer male line with a mare who had the Windfields wonder in her broodmare sire line. We also see Riverman in the damsire line of both Highest Honor and Anabaa; in fact, those two stallions have additional pedigree similarities as well, with both showing instances of Sir Gaylord, My Babu, and Princequillo. Interestingly -- in an academic sort of way -- Silver Frost (IRE) has two siblings. His full brother is the French-bred Blazon (FR), who is of course by an Irish-based stud. Hidden Silver's 2008 foal (an as-yet unnamed Poliglote (GB) colt) is an Irish-bred son of an English-bred stud that stands in France. Read more about Silver Frost's win in the Poule d'Essai des Poulains and Elusive Wave's victorious run in the Poule d'Essai des Pouliches: Siver Frost Burns Rivals in French Guineas.